All family and professional caregivers are invited to attend this valuable free conference! We know caregiving can be difficult so this is your day to learn and be supported in your caregiving journey. You will have the opportunity to attend expert presentations, ask important questions, and enhance caregiving skills while networking with other caregivers. 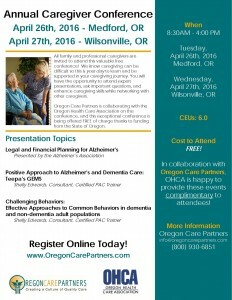 Oregon Care Partners is collaborating with the Oregon Health Care Association on the conference, with two opportunities to attend in either Medford, on April 26, or Wilsonville, on April 27. This exceptional conference is being offered FREE of charge thanks to funding from the State of Oregon.